This failure mode is most often caused by clogged air ports. It may also be caused by an unbalanced shaft. For Routers, aggressive routing speeds or clogged bits will contribute to this failure as mode. 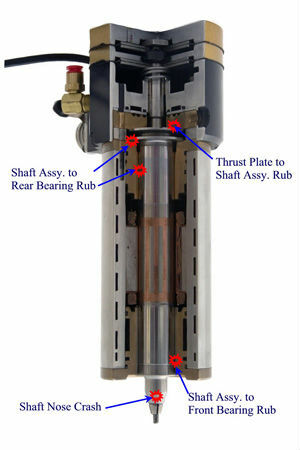 The air pressure to keep the air bearings “stiff” must be at least 80 PSI at the input to the spindle. Using collets that are not specifically designed for the spindle will cause high speed unbalanced condition. This failure mode is most often caused by improper vacuum flow or lift. Vacuum lift should be 20-25” water. Polished (”rebuilt”) front bearings will not have the correct air gap. For routers, routing too fast overpowers the bearing. The air pressure to keep the bearings “still” must be at least 80 PSI at the input to the spindle. This failure is typically caused by Chip Loads that are too aggressive, or by normal chip loads with large tools that are dull. This may also be caused by hitting or drilling tooling pins/clamps. The air pressure to keep the bearings “stiff” must be at least 80 PSI at the input to the spindle. Improperly balanced shafts will also cause this condition. 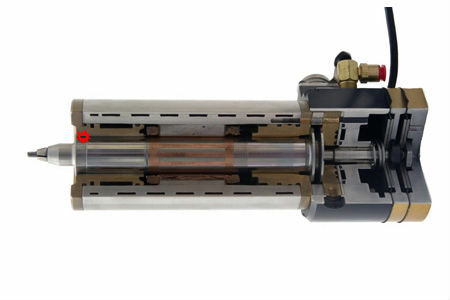 Using collets that are not specifically designed for the spindle will cause high speed unbalanced condition. Air bearings are between .00015” to .0004” wide. The air pressure to keep the bearings “stiff” must be at least 80 PSI at the input to the spindle. Air pressure not to exceed 90 PSI. Maintain the cooling system. Overheating a spindle causes the metal to expand, suffocating air bearing gaps.